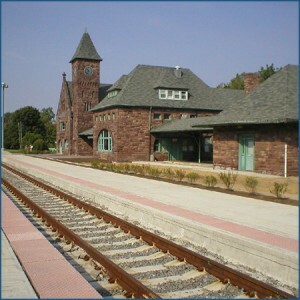 One of Michigan’s finest historic stations will be the site of the April 20 MARP meeting in Niles MI. On the agenda is Rodney Pena, Amtrak Deputy Division Engineer, who will talk about ROW and track engineering on the Amtrak- and MDOT-owned trackage in Michigan. With the recent purchase of Norfolk Southern property, the majority of the Wolverine route in Michigan is controlled by either Amtrak or MDOT. Amtrak has a maintenance facility east of the passenger station in Niles. If you live along the Wolverine route, we hope you will join those who are taking the train to the meeting, something we can seldom do because of unaccommodating schedules. And remember, the train flies at 110 mph between Kalamazoo and Niles! Because Wolverine Train #351 is an express train and doesn’t usually stop in Niles, you will have to buy a ticket to Chicago. HOWEVER, THE TRAIN WILL MAKE A SPECIAL STOP IN NILES TO DISCHARGE MARP MEMBERS, arriving at approximately 10:13 am. Eastbound Train #352 departs Niles at 3:33 pm. We will have lunch following the meeting at the Nuggett Downtown Grill , which is 0.7 mile from the station. If necessary, we will arrange for Dial-A-Ride transportation ($3 each way). I can walk the 0.7 mile to and from the restaurant. I will need transportation to get to and from the restaurant. Thinking ahead, please MARK YOUR CALENDARS and make plans now for a special August 9-11 weekend event for MARP members aboard the historic train car ferry S.S. City of Milwaukeemoored in Manistee. Watch for details in the Spring issue of The Michigan Passenger and in the online bulletin ON TRACK. We look forward to seeing you Niles!